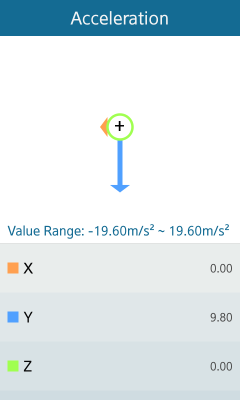 The SensorApp sample application demonstrates how you can retrieve data from various Tizen sensor types, such as acceleration, device orientation, and gravity sensors, using the Tizen Sensor API. 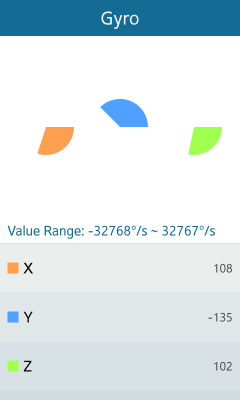 The following figures illustrate the main screens of the SensorApp. Provides an entry point to SensorApp. Creates and launches the application instance. Manages the application life-cycle. Creates the application main window, naviframe, and sensor list view. Provides convenient macros for writing log messages. Provides convenient macros for colors stored in integer. Defines data types describing various sensors. 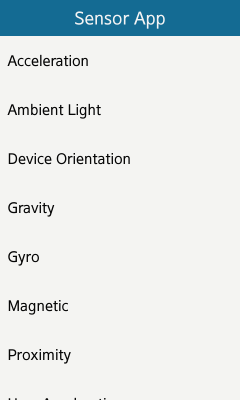 Defines the sensor list provided by SensorApp. Defines the magnetic sensor strength calculation algorithm. Provides the application main window with a background and conformant. Provides the sensor list view. Provides the sensor data view for displaying data retrieved from sensors and their graphical representation. Defines basic chart drawing functionality. Defines data chart private members for use in vector and angle charts. Draws a vector chart for representing vector values using arrows (for X and Y and a circle (for Z). Draws pie charts for representing angle values. Retrieve the sensor handle and hardware information. The sensor_list_init() function in the sensor-list.c file retrieves the sensor handle and hardware information and stores them in the sensor_info array. The retrieved information, such as sensor range and resolution, is later used to display the sensor data properly. The <sensor-info.h> header file defines a structure for storing information about the sensor that is used to display the sensor list and sensor data. The sensor-list.c file defines the sensor list array for storing information about each sensor. The sensor-list-view.c file creates and fills elm_list using the sensor list provided by the sensor-list.c file. While filling the sensor list, the _list_view_fill() function checks whether each sensor in the list is available on the device using the sensor_is_supported() function. When a sensor is selected, the _list_view_sel_cb() function navigates to the sensor data view passing the selected sensor information. To start receiving sensor data, the _data_view_sensor_start() function registers a sensor listener, sets the sensor event callback, and starts the sensor. When the _data_view_sensor_cb() sensor event callback is called, the _data_view_value_items_update() function displays the received sensor data in genlist items and updates the chart, if necessary. To stop receiving sensor data when the sensor data view is destroyed, the _data_view_destroy_cb() function calls the sensor_listener_stop() function and then destroys the listener using the sensor_destroy_listener() function.